Whether it's a school holiday play date or a family gathering on Easter Sunday keep little hands and minds busy with spring themed activities. At this time of year it's hard to know if the Easter bunny will need wellies or a sun hat when he comes to deliver his chocolaty treats. On the off chance that it might be too wet, windy or cold to spend all of the school holidays outside (odds are you'll be spending some of your time indoors!) 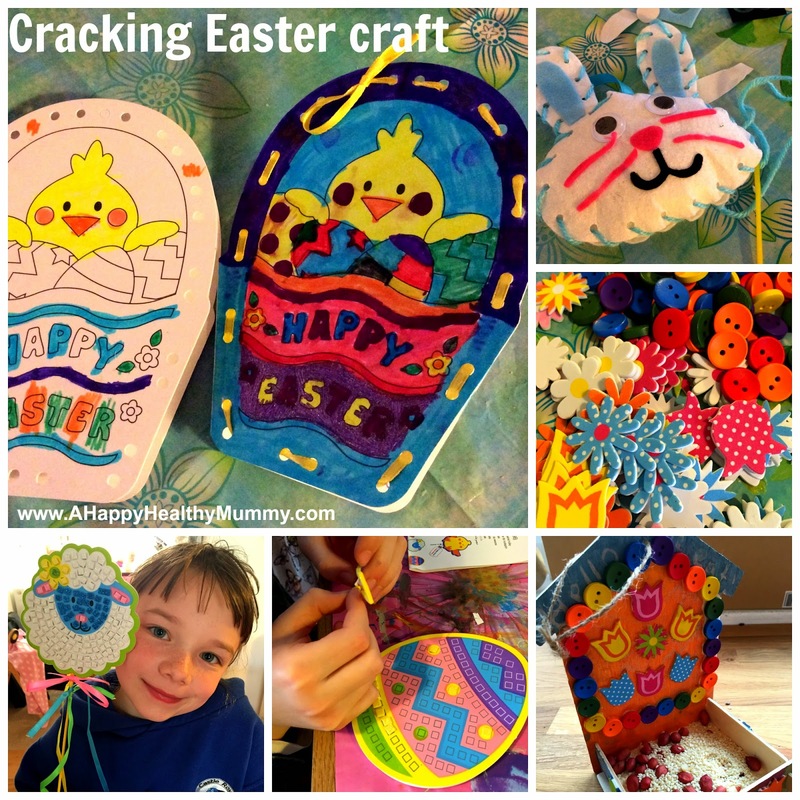 it's great to have some craft activities on hand to entertain the children for the bank holiday and beyond. Kids always have a whale of a time decorating the tree at Christmas, which might be one of the reasons you can increasingly find sparkly eggs dangling from branches these days. I got my 'tree' from Lidl and my girls were more than eager to adorn it with treasures from Easer baskets past, pretty stickers and their newly-created decorations courtesy of Yellow Moon. 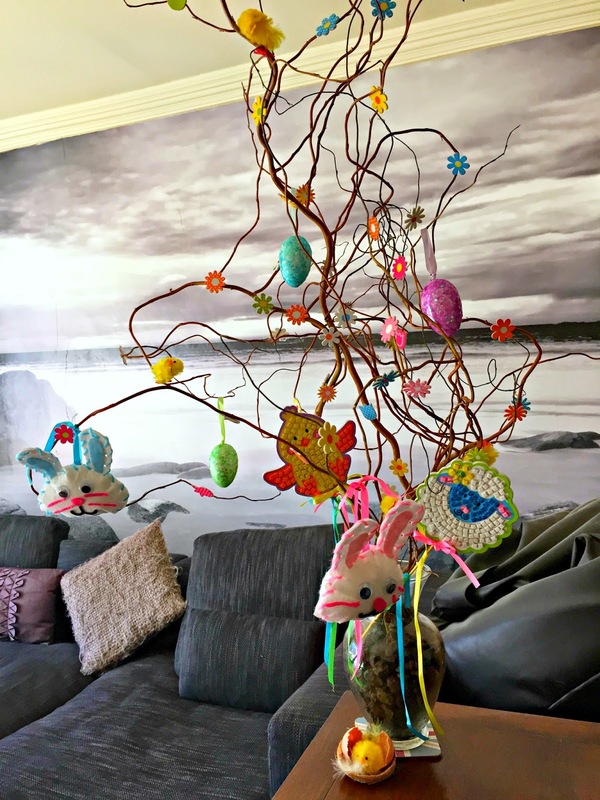 And an Easter 'tree' makes a lovely centrepiece! My youngest has recently discovered sewing in a big way - due in part to a very impressive after-school club she attends. I've already been on the receiving end of a fetching 'LOVE' banner on Valentine's and a beautiful lavender-scented cushion for Mother's Day. Accordingly she was keen to get to work on the Easter Bunny Sewing Decoration Kits - making one up for Granny - her personal sewing and knitting guru. Meanwhile my older daughter set about the Easter Basket Ribbon Lacing Cards for her nearest and dearest. The Easter Mosaic Wand Kits were also hit when we had a few friends over, and it was interesting to see that all four girls (aged, 6, 7, 8 and 9!) were equally able to make up the wands and enjoyed doing so. The older ones are obviously still at an age when sparkly, beribboned goodies are the best goodies (long may it last)! It wasn't a very auspicious start to the Summer locally - in fact it poured with rain and howled with wind for most of the day here. However, surely we are due for some warmer, drier days as we head into April? With that in mind, it's nice to start thinking about the garden again. And why should the garden just be adorned with plants?! My girls like to take their craft offering in and out of the house. And despite the fact our cat is not keen on the garden birds, it didn't deterred my eldest from creating a rather super feeder for her feathered friends - fully painted and decorated for their delectation (I hope they like things bright...)! Her sister opted to create a house for a rubber duck - not as nature friendly perhaps, but still just as cute! Here's hoping you have an 'eggcellent' Easter too!